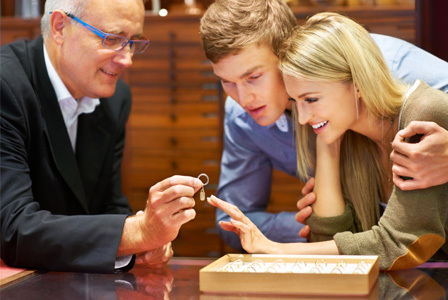 Getting Engaged: Ring Shopping – Part 1: Surprise Her or Shop Together? Posted 1:55 am by admin & filed under Mark Silverstein Imagines. You’re getting engaged! Or you think you’re ready for this next step in your life. The answer to this should be determined by what’s right for your relationship. Does your girlfriend love to be surprised? Or would she rather be there to help pick out the perfect ring? Do you know her preferences well enough to find something she’ll love? Or would she in the back of her mind be disappointed if you didn’t include her? There’s no right answer–just what’s right for the two of you! You want the full surprise effect. You don’t want her to know it’s coming and you want to show her you know her as well as you think you do. The decision to go it alone without guidance/help from your beloved can be bold and daring but not without risks. How well do you know her preferences? Have you secretly spied her magazines; checked out her Pinterest boards; consulted her family and friends? You’re potentially setting yourself up for a catastrophe of epic proportions. And she will. She trusts you. (Assuming) You’re marrying the right person for you – she will adore any ring you give her for one reason alone – it came from you. It also helps that in her mind it shows a romantic/spontaneous side to you as well as your desire to commit to her for life. For as many couples that can pull this off, there are just as many that decide it’s not for them. Let’s say you’re a couple who decides to shop together. In this scenario, you know that giving her a ring she’ll be happy with forever, far outweighs the element of surprise. Her potential disappoint bordering on wrath, may be enough to say that surprise isn’t a necessity. One of the great benefits of shopping together is eliminating the risk of spending your time looking for a ring that ultimately isn’t exactly what she wanted. If you go together, you know she’ll be getting something she loves. Think of it as first in a lifetim e of big decisions you’ll be making together. While this approach may leave less to the imagination, how do you add surprise back into the equation? I’ve seen many couples shop together and pick out a few options. Then he will go back later and make the final decision. When the time comes to pop the question, there’s still a factor of the unknown that will allow for a surprise. She knows that regardless, she’ll get one of her favorite styles and you’ll get the satisfaction of maintaining some level of surprise. Don’t forget, there’s always the surprise of when, where, and how! Yes, she’ll know you’ve got a ring for her and a proposal is coming – eventually, but there will be great anticipation and excitement for her in not knowing the details. And when the moment comes for you to drop down on one knee, swing from the trees, hire a professional skywriter, put it up on the big display at the game, or whatever it may be–she’s sure to be plenty surprised when it does happen! Check back soon for more blogs to help you in your shopping and surprising endeavors! Part 3: Wedding Bands – Often a last minute decision.